ANRC competitive programs focus on developing excellence in riding skills, knowledge of riding theory, and the horse’s performance. 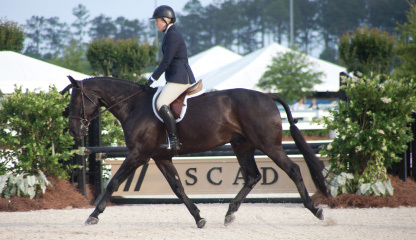 ANRC educational materials provide visual representations of good performances, as well as specific programs and schooling techniques for the rider to follow. The DVD series, “The American System of Forward Riding: Life Lessons Learned with Horses” was produced by R. Scot Evans and Shelby French to guide the rider through the American System of Forward Riding. This resource as well as other resources are available for purchase in the ANRC online store. Students may compete on a school-owned horse or a privately owned horse. The highest score in each phase will be awarded to the rider who demonstrates excellence in equitation and produces a smooth, cooperative performance exemplifying quality hunter movement both on the flat and over fences. Throughout the year, coaches are encouraged to incorporate forward riding theory and sound stable management practices to improve the rider’s mounted and unmounted horsemanship skills. Students are encouraged to set personal goals as well as team goals, study ANRC materials, practice fundamentals, and apply knowledge. Established in 2006, ANRC fosters the mission of the former Affiliated National Riding Commission, which existed as part of the American Alliance for Health, Physical Education, Recreation, and Dance (AAHPERD) for more than 60 years. ANRC’s educational system is based on the teachings of Captain Vladimir Littauer, who came to the United States in the thirties and established a riding school and is author of the book Commonsense Horsemanship. His progressive forward riding system influenced many professional riders and trainers, including Jane Dillon, George Morris, Joe Fargis, Lendon Gray, Pam Baker, and Bernie Traurig.